LAHORE: (Thursday, February 15, 2018): Punjab Information Technology Board’s Program Head Syeda Mahak Jamal has said that the students of Punjab University have attracted business of 14,000 dollars through E-Rozgar centre set up at PU in just three months through free-lancing. 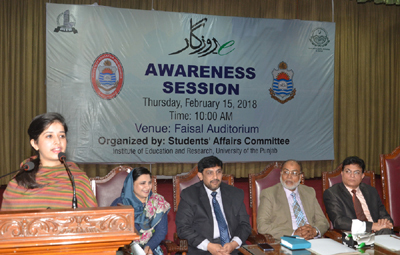 She was addressing an awareness seminar regarding Punjab government’s E-rozgar initiative organized by Punjab University Institute of Education and Research here on Thursday. 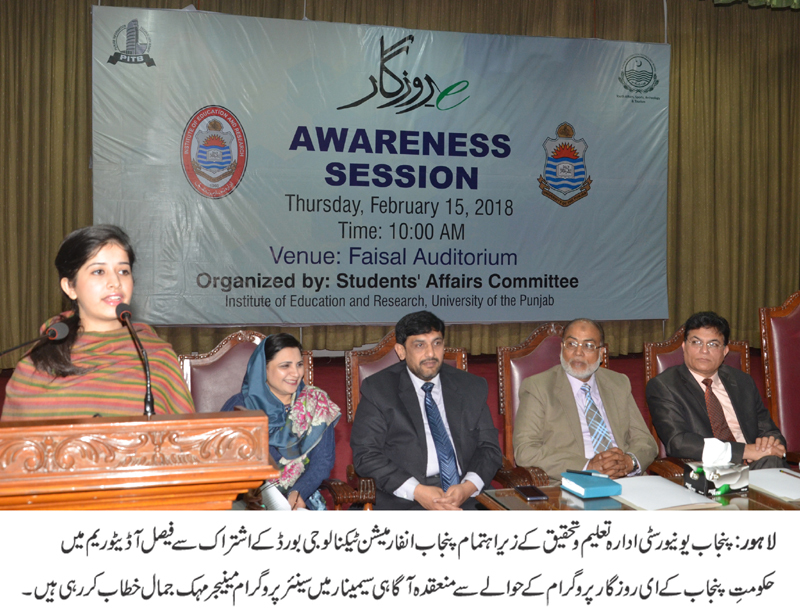 IER Department of Secondary Education Chairman Prof Dr Abid Hussain Chaudhry, Prof Dr Rizwan Akram Rana, Student Adviser Dr Tariq Hussain, PITB’s Muhammad Amjad, senior trainer Ali Abbas, heads of various departments, faculty members and a large number of students were present on the occasion. Addressing the ceremony, Ms Mahak Jamal said that E-Rozgar initiative was launched to reduce joblessness from the province and E-Rozgar centres had been established in 36 districts of the province. She said that technical training was also being provided to students regarding free-lancing. She said that PU students had learnt graphic designing, web-making, SEO and other related software through the centre. Prof Dr Abid Hussain Chaudhry said that E-Rozgar had provided the best opportunity to earn money through respectful means while sitting at home. He appreciated Punjab government for resolving job-related issues of the youth. Senior site manager Muhammad Amjad briefed the participants over conditions regarding admissions in E-program.